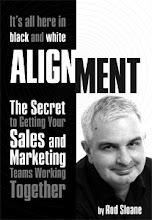 Sales and Marketing Alignment Blog from Rod Sloane: Come and Hear Me Speak in London on November 6th. When I was younger, so much younger than today, I used to frequent comedy clubs. I was just a member of the paying audience. We enjoyed ourselves, drank some beer, heckled some and laughed. But most of all I admired the talent and bottle of those stand-ups who entertained us. They had my respect. Now, I was too much of a wimp to have a go at stand-up, so I did the next best thing, that is speaking to groups. Call it public speaking, professional speaking or showing-off….I love it. Maybe, I just like being the centre of attention in Rod’s World. If you have never seen/heard me speak, then you hear me speak on Thursday November 6th in London. Why should you come out and hear me speak. 1.) I’m only speaking for 15 minutes so you won’t have to endure too much.